How on earth is it February? I'll tell you one thing: this is my husband's favorite month, because it means the 5-month-long celebration has finally come to an end. In October, we have both his parents' birthday, plus Halloween. In November, there's our wedding anniversary, our son's birthday and Thanksgiving. In December, there's obviously Christmas and New Year's. January brings my birthday, and February is Valentine's Day. So, as of February 15th, Tim gets a long, well-deserved respite from the holidays. At least for 237 seconds. I want to be real with you, because you're my people, and that means something to me. Tim and I don't actually believe in Valentine's Day. I mean, it's great. The whole love-the-one-you're-with thing, or the "anti-Valentines Day" parties. Whatever strikes your fancy. But after almost 10 years together, we've finally admitted to each other that we're just in it for the food. With that being said, I would like to point you Deborah, a blogger who just published an incredible red velvet themed cookbook out right now. 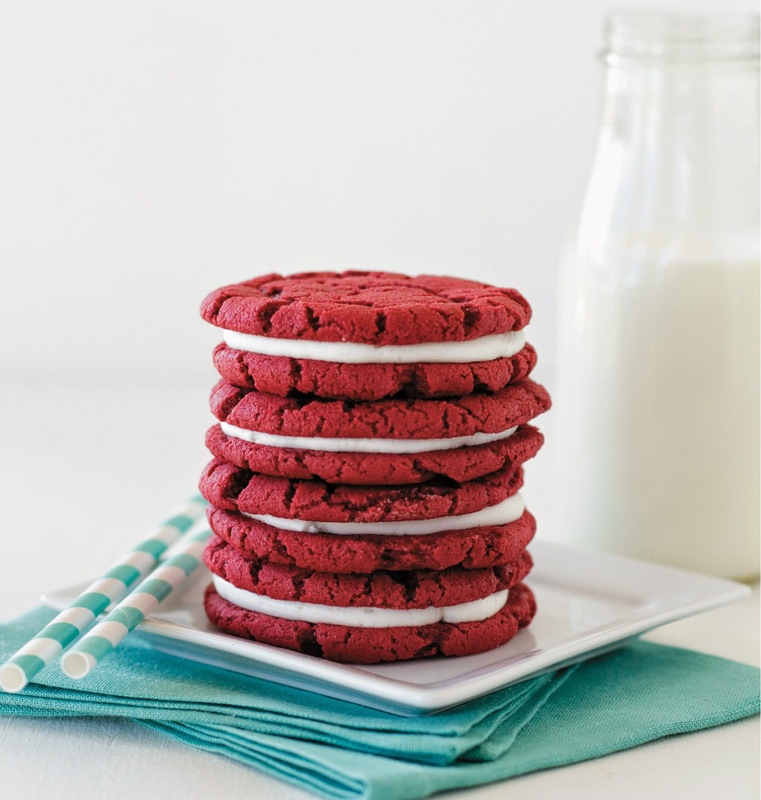 * You can find her over at "Taste and Tell," a wonderful site with really innovative recipes, including these red velvet oreos. With her permission, I've posted the recipe below, but make sure to check out her other red velvet recipes by visiting her site. 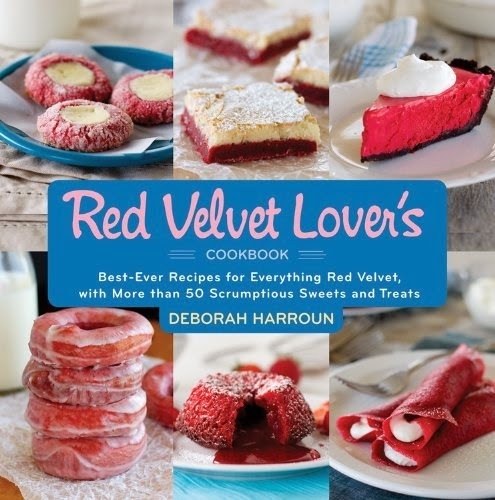 You can also visit Amazon, Barnes & Noble, and any major book retailer to purchase her book, "Red Velvet Lover's Cookbook: Best-Ever Versions for Everything Red Velvet, with More than 50 Scrumptious Sweets and Treats." Okay, now for the giveaway: I loved this cookbook so much that I purchased an extra copy to give away to one lucky reader. All I need to know is what you do on Valentine's Day. Your misery or excitement towards this particular holiday won't affect your chances of winning ;) Just leave your message in the comments on our website or Facebook page. The winner will be picked randomly and announced on Tuesday, February 10th. 1. To make the cookies: Position oven racks in the upper and lower thirds of the oven and preheat the oven to 375°F. Line two baking sheets with parchment paper. 2. Whisk the flour, cocoa, baking soda, baking powder, and salt in a bowl to combine. Beat the sugar and butter in a mixing bowl with an electric mixer until light and fluffy. Beat in the egg and food coloring. Add the dry ingredients and stir until the dough comes together. 3. Form the dough into balls (about 1 tablespoon each) and place the dough balls at least 3 inches apart on the baking sheets. Flatten the balls slightly with the bottom of a drinking glass. Bake until the edges start setting, 7 to 8 minutes. Cool for 5 minutes on the baking sheets, then transfer to racks to cool completely. 4. To make the filling: Beat the confectioners’ sugar, shortening, butter, water, and vanilla in a mixing bowl with an electric mixer until light and fluffy. 5. Place the filling in a pastry bag fitted with a ½-inch round tip. Turn half the cookies over and pipe about 1 teaspoon of the filling onto the flat side of each cookie. Place another cookie on top of the filling, flat side down. Lightly press the cookies together to spread out the filling. Store in an airtight container for up to 3 days.